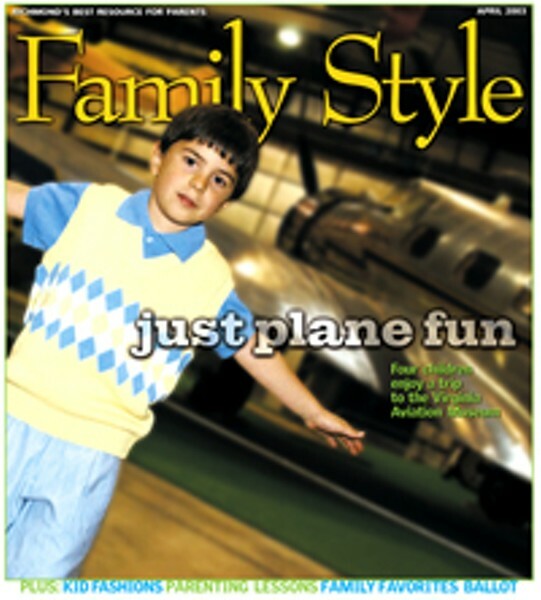 Parental Guidance | Family Style | Style Weekly - Richmond, VA local news, arts, and events. Mothers and fathers share the best parenting lesson they have learned. At Home: Labrie and his wife, Lucy, always find time to play with their children. They believe that home life should be structured. Regular bedtimes are important in the Labrie household. And, dinner is together time. Since each child has his or her own activities, Labrie and his wife make one-on-one time for each child. Weekends are family time. Most Valuable Lesson:	"The key to parenting is affection and love. Time goes by very fast. You have to take the time to enjoy them. Children need your attention. Think about what life is about. You also have to have your values straight. When children are little, they need structures and tools to grow. That will help them later in life. One thing that we do is to let our children fail when they are young. It helps teach them about responsibility and they learn about consequences early on." At Home: Allen is a single mom and entrepreneur. She describes her home life as busy. "My house is always the hangout for my sons' friends. One time we had the whole basketball team camp out on the floor." Allen and her sons use every opportunity to communicate and connect, including time in the car driving to and from activities. Most Valuable Lesson: "I have learned that letting my children know that I love them unconditionally and fostering their self-esteem and perception of self are the greatest gifts that I can give them. I tell my children that I love them often. I tell them that I love them and to have a good day whenever I send them off to school, regardless of the argument we may have just had. I never allow them to make derogatory statements about themselves or to each other. I encourage them to dream and set their own goals by talking about how their strengths can pave their direction in life. I believe that children need to be valued for who they are. If you put too much pressure on performance and expectations, they will feel that love is based on performance. You need to give positive reinforcement. It's not all about performance. I've also learned to model the behavior that I want my children to develop. It takes their excuses away. I never say to my children in words or actions 'do what I say and not what I do.'" Marcus Allen likes to help mom with her work. At Home: Francis describes life in their household as chaotic at times. During the school week, Francis and her husband, Gary, spend their time shuffling between karate classes, cub scouts, chorus and homework. "We try to sit down as a family and have dinner," Francis says. "We adjust our dinner around the various schedules." When Nicole is home from college, Francis tries to spend quality time with her. "We allot time to each child as they need it," she says. Most Valuable Lesson: "Patience and simplicity. We have to have patience in everything we do, especially when we are teaching our children. If we lose patience with our children, they will seek advice elsewhere and we wouldn't want that. Simplicity refers to how we look at life. With our twin boys, it's nice to look at the world through their eyes. It's just a matter of slowing down and taking the time to do it." At Home:Smith and her husband, Leigh, have a nanny that helps them hold the household together. "My kids have three parents instead of two," Smith says. "There is a sense of order and calmness about our nanny. She's like a grandmother." This is the first year that all three boys are playing on different sports teams. "My husband was trying to figure out how [family] zone defense will work. Sometimes their extra-curricular activities take on a life of their own." The evening meal is a commitment for everyone. "It's a priority for our family. It's an opportunity for us to practice being together and have the children tell me about their day." Most Valuable Lesson: "Last spring, my oldest son was hit by a car. He was leaving the house to go play soccer. I immediately kicked into physician mode, helping to stabilize him. Then in the emergency room, I kicked into mom mode. (Zachary wasn't seriously injured and didn't need to be admitted to the hospital.) It was a lesson for me and him too. I am the queen of safety. My kids have the rules of safety and common sense things drilled into them. I've learned that you can't beat yourself up over accidents when they happen. The parenting piece is important: Even when you think ahead and try to avert disaster, bad things can happen." At Home: Robertson tries to spend as much time with his boys as possible. He likes to fix them breakfast and dinner, when he can. After dinner, Stokes sits on the sofa and reads to his brother and his dad. Then it's time for dad to read a story at bedtime. In between there may be a friendly wrestling match or two. A pilot, Robertson loves to take the boys on vacations. "I love flying," Robertson says. "My father had an airplane and took us on family trips. I'm just passing on the tradition." Most Valuable Lesson: "It's important to be really engaged with your kids. It's easy to talk about work and everyday demands and use them as an excuse for why you can't spend time with your children. Being engaged with my kids makes me feel like a kid again. Children want you to be involved in activities with them. It's real easy to let kids do their own thing and that's ok to do for a certain amount of their time. But kids are kids for just a short time and parents need to take advantage of that and be a kid again. When my sons tell me that they really enjoy doing things with me, it means a whole lot to me. My kids are the greatest." At Home: Trigiani and her family live in Greenwich Village in New York City. Her husband, Tim Stephenson, is the Emmy award winning lighting director for "Late Show with David Letterman." Trigiani describes her life as "nutty by day and peaceful by night. It's a juggling act, but who doesn't love a juggler?" Most valuable lesson: "It came from my father, who was a good papa and realist. He passed away in December, Lucia was born last June, so he had a few months to share his parenting beliefs with me. I told him that I was not going to allow Lucia to watch television. I want her to color, draw and play outdoors, read and be with other kids. Dad said that was terrific, but that not letting her watch any television was a mistake. When I asked him why, he told me that the world could be dangerous, but it is also magical, and that a child has to live in her culture, in the reality of the moment, so she is part of her times. 'Let her live in the world,' he said. 'Now don't let her watch it all the time, but once in a while is fine.' Then, he took a deep breath and said, 'You can have all the rules in the world, but I only know one thing for sure about being a parent, the only thing you can really do for your child is to be there for her.' I think of his words often. Being a parent is a slippery slope, of course, but I try to hang on to the magic."